Ok I admit that I never made a formal announcement about it, but this blog has now moved to its new home at http://nullpointer.debashish.com. If you are reading this, you are at the right URL. This blog used to be happily hosted at the excellent free service provided by the JRoller people. Roller is one of the advanced blogwares around, written using Java and I enjoyed using it throughout. If I could afford Java hosting, I would have probably gone for JRoller again. However, with PHP there is hardly any competition for WordPress. So dear readers, here is Null Pointer on WordPress, running on the pretty Squible theme. Now to the crux of this post. How did I manage migrating all the Posts and comments from JRoller to WordPress? Now the last step is not that intricate because, guess what, WordPress 2.0 does provide the facility to import a blog from a RSS feed. Yet the ordeal would be far from over, because while WordPress can import posts from your feed it cannot import the post comments. 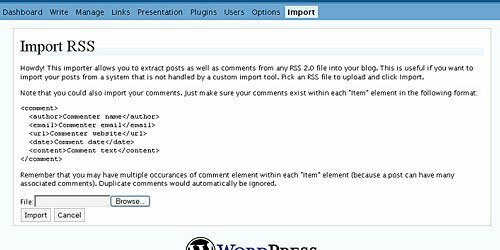 Nothing against WordPress, the RSS 2.0 specification does allow a comments sub element but that can only be a link to the actual comments page. So basically we need to defy them all, add the comments inline in our custom RSS Feed and then modify the wordpress RSS Import Utility to decipher and import the comments as well. When you are ready with your JRoller blog feed, just backup the existing RSS Importer file (wp-admin/import/rss.php) and place the modified importer PHP there. Rest is easy, only remember to break up your RSS file into smaller chunks if you have a really large blog, the importer has the tendency to timeout often. Click here to view the Roller template to create your custom RSS2.0 Feed that includes comments as well. Click here to view the modified WordPress RSS Importer. I hope this post helped you, do leave your comments here. Pingback: Dewavrin Luc ’s web site » Blog Archive » Hello world! Yes, I noticed the same and I have also modified at my blog! Thanks Haredik for pointing the wrong timestamp on comments. Infact this is a bug in Squible, it displays the “Post Timestamp” with the comments as well. I changed the theme’s comments.php and it works fine now. One more thing, I noticed that dates at your site are not proper… It shows Tuesday, April 4th, 2006 for today’s post! Hardik I think your problem is that you don’t have UTW (Ultimate Tag Warrior) plugin on your WP install. UTW gives you the option to treat Categories as Tags ahd handles it on its own. I think my current wordpress supports “Categories” while this theme requires “Tag” system. So, how can I migrate from categories to tag? Please ignore my last comment. Your macro works just fine in roller 1.2. Not sure what I was doing wrong initally, but after creating a new template it worked fine. Thanks for great information on importing into WordPress from Roller. Unfortunately for me I am using Roller 1.2, which looks to not have a few of the functions that you show using in your macro. If anyone has a Roller 1.2 script that works please let me know. Thanks again for the article and pointing me in the right direction. Mabrooq! (Congratulations in Arabic) on migration of Null Pointer to new location. Please contribute in WordPress Wiki regarding Migration Process or inform Support forum in WordPress.org. Looking forward to more technical posts at Null Pointer. Debashish Replied:Shukran! The link to the post on Migrating Blog from Roller to WordPress has already been added to their Wiki.